When you look around the world – both online and offline – it appears as if the world is beginning to value simplicity more than it has in a very long time. By this, I mean that the way that things are designed: From billboards or magazine covers, to the minimalistic approach of interior decorating, all the way down to the interfaces on our phone. On top of that, I think that we’re collectively beginning to understand that simplicity is not necessarily an antonym for complexity – instead, it’s a way that functionality can be achieved such that it’s easy for the consumer. Complex operations happen all of the time through the use of simple actions. Think about what happens when you turn the key to your car, press the power button on your computer, and so on. The neat thing is that WordPress values simplicity to the point that it’s included within its very philosophy. 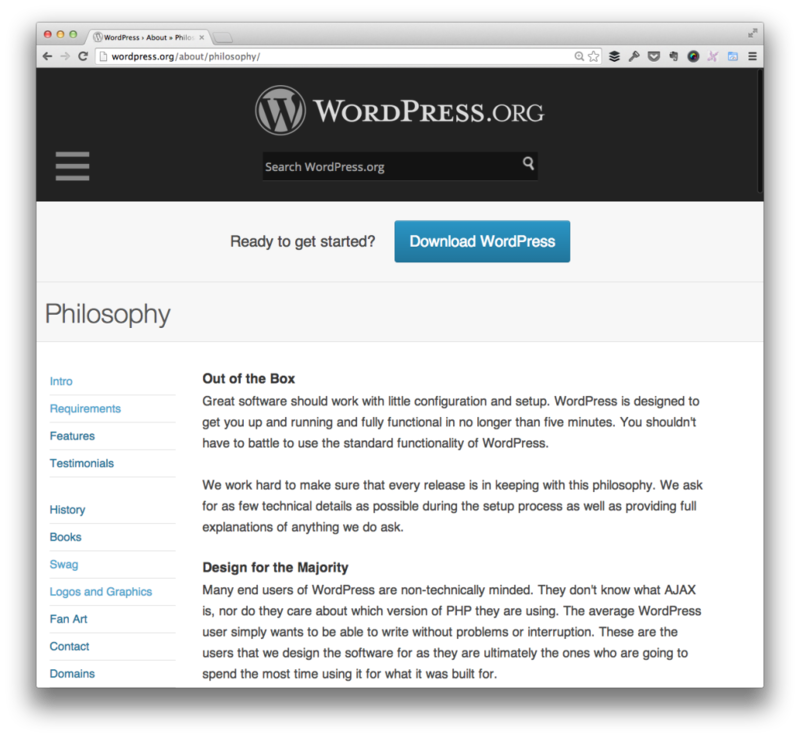 And for the past few articles, I’ve been writing about the WordPress philosophy and how we – as people who help to drive the WordPress economy – are disrespecting the philosophy. I want us to turn that around. With that said, let’s talk about simplicity. If I’m being honest, I feel like talking about simplicity is almost a wasted effort because it’s something that’s discussed so much especially in the online space. On top of that, we’re living in post-Steve Jobs world where, for anyone who has read his biography or who knows anything about the man, know that he took serious pride and devoted serious energy into trying to achieve simplicity in the work that he and Apple did and that Apple continues to try to do. The frustrating thing is that all of the above quotes and other people who have contributed to simplicity end up being used as examples so much so that they are built into our collective conscious and then we easily dismiss them because we think we already know what people are going to say about it. But come on: Inspirational people and ideas shouldn’t become less so over time, so why should we treat them as such? In past releases we’ve taken major steps to improve ease of use and ultimately make things simpler to understand. One great example of this is core software updates. Updating used to be a painful manual task that was too tricky for a lot of our users. We decided to focus on this and simplified it down to a single click. Now anyone with a WordPress install can perform one click upgrades on both the core of WordPress and plugins and themes. For someone who has used WordPress for several years, I do believe that WordPress itself has become much simpler. I also contend that there’s more to work to be done, and I think the majority of the core contributors would agree. But that’s why this is part of the philosophy, isn’t it? To continue striving for that with each new release. This particular aspect of the philosophy is even a little bit out of date because now, although you can still update with one-click, automatic updates were recently introduced into WordPress core. But this philosophy – like the rest of the pillars that we’ve discussed this far – should also be part of the work that we’re building on top of WordPress. 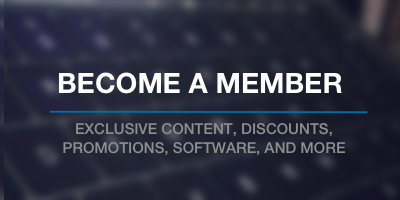 This obviously includes things such as themes, plugins, applications, and so on. Instead, we’re continuing to head into the opposite direction. I believe this goes hand-in-hand with “decisions, not options” to a point where the more options that we give our customers and users, the less simplicity we’re introducing into our work and consequently into the market. This means that, in the worst case scenario, when someone is looking at WordPress as a viable piece of software to use with a lively economy, reads the philosophy, is inspired, then sees what we’ve done, many would likely laugh and dismiss it because so many of the products available today are in direct opposition to this. And I wouldn’t blame them at all. But, as with the rest of the philosophy, there are things that I believe that those of us who are involved with WordPress should do in order to help begin turning this around. Ironically, this won’t be simple. We’ve got our work cut out for us, but it’s going to require significant changes in the work that we’re doing and it’s going to require more than just giving lip service to ideas that sound nice. It’s going to require work, re-engineering much of what we’ve done, and even resetting customers expectations of our work. We’re never done with simplicity. We want to make WordPress easier to use with every single release. But how does this apply to themes, plugins, and so on? I don’t want to say that it’s easy, but there’s no such thing as perfect software. There are always going to be bugs and frustrating points for the users. It’s important for us to understand that, and to understand their pain. To that end, why not ask what frustrates them the most, and aim to try to introduce a bit more simplicity in existing features? There’s no reason that each new version has to include a set of new features that haven’t previously existed. Sure, that’s a trend that has occurred in software, but that doesn’t mean that improved simplicity and ease of use have to be neglected. Remember: For every one new thing that we introduce, we’re forcing more work to be laid upon the user. We can do better than that. We should do better than that. Why aren’t we doing better than that? In past releases we’ve taken major steps to improve ease of use and ultimately make things simpler to understand. This point perfectly exemplifies what I’m trying to say: As developers and designers, why can’t our iterations focus on making things easier for the user to navigate, to find, to understand, to use, and so on. Instead, the trend seems to be fix bugs that exist, let the user know the bug no longer exists, introduce a new feature (that likely has its own set of bugs), and then repeat. Why not stop that method of operation and try something new: Take each iteration, a pick a pain point or two and hyper-focus on exactly that in order to make sure that the feature is as simple, is as easy-to-understand, is as easy-to-use, and is as rock solid as possible. Then move on to introducing new features. We love to challenge ourselves and simplify tasks in ways that are positive for the overall WordPress user experience. Many who get into design or programming do so because they love the challenges that it presents. Sure, I know there are some people who treat it more like a standard 9-to-5, care less about quality than some, and generally do just enough to get by. But many of us love challenges – we love solving problems for ourselves, for others – and we love doing so in elegant ways. I believe that designing and coding are simultaneously extraordinarily frustrating and extraordinarily rewarding. At least, many of us say that, but I also believe that many of us feel that way and our work reflects it. But it needs to be more widespread – to have wider adoption. If truly we truly love the challenge that comes with writing software and solving problems, or – as the philosophy states: “We love to challenge ourselves, ” we are not doing a good job of this. Our work should result in changes that “that are positive for the overall WordPress user experience,” and this includes the themes, plugins, and so on that are developed on top of the core application. For the average user, they can’t tell where a theme ends and WordPress begins. All they know is that they’re using WordPress. If our work is causing them frustration, WordPress is causing them frustration. Every version of WordPress should be easier and more enjoyable to use than the last. ..and this should be true for every plugin, every theme, every extension, every product, and so on that’s built on top of WordPress. When updates happen within WordPress, users should get excited – not nervous – about what’s about to happen to the software they’re using to publish their work. Instead, we hear grievances about the frustration that it causes, the incompatibility of something that doesn’t previously exist, or the removal of something that they really liked and now they can’t find their data and they don’t know how to rollback to get it (let alone know what “rollback” even means). And this isn’t a pipe dream: The WordPress economy is full of designers and developers who talk with each other on a near daily basis using services such as Twitter. Some of the brightest people I have ever met are working on WordPress. They’re inspirational in and of themselves. As such, I know that the move towards greater simplicity can be achieved. But it’s going to require a lot of work – a revamp of the way we iterate on our work, an approach to designing, engineering, and architecting our products that forces a segmentation in the market that separates quality of from quantity. Quality of work, quality of design, quality of features, quality of ease-of-use over the quantity of options, quantity of choices, and quantity of vendors who are looking more to make a quick buck than to do something impactful with their lives in the context of software. Harsh? Maybe. Realistic? This isn’t the first gold rush in history and it’s not going to be the last. So why would we not do the very best work that we can in striving for simplicity for our work, for our customers, and for WordPress as a whole. It’s powering more than 20% of the web – let’s not turn that 20% into a pile of frustration. I fear that the direction in which WordPress products are headed are already doing that, but it’s not too late to fix it.